Home > Products > ChargeIt by Jay Silver Plaid Acrylic Charger Plate 13"
Add class and sophistication to your formal catered events with the ChargeIt by Jay Silver Plaid Acrylic Charger Plate. 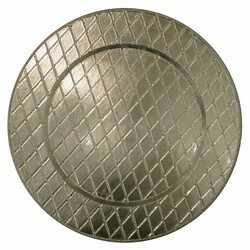 Excellent for wedding receptions, engagement dinners, and other special occasions, this charger plate boasts a unique silver plaid pattern that adds visual flair to any table setting. Made from solid acrylic, this premium quality charger plate combines an upscale appearance with outstanding durability. Thanks to its 13" diameter, this round charger accommodates any size plate and prevents spills and mess that might otherwise stain your tablecloth. To retain its luster, hand washing is highly recommended.